Home » Get on the Map–And Get Even More Savvy about Your Grantmaking! Get on the Map–And Get Even More Savvy about Your Grantmaking! Access to accurate, up-to-date grantmaking data is critical to understanding the funding landscape and ensuring that your giving is as effective as it can be. And that’s what this campaign is all about! To improve the quality, timeliness, and availability of rich grant data—for and about funders in our region. And it all starts with you—sharing your current grants data. If I Share My Data, What’s In It For Me? When you share your data, you’ll be making a powerful contribution to Foundation Maps, a highly interactive, searchable mapping platform from Foundation Center that will be accessible to all NCG members. Who else is funding a particular issue in our region? What organizations are tackling that issue? Who is working with specific populations in our community? Who may be natural collaborators? Where are there gaps in funding? How much money is collectively going to specific issues or areas in our region? What are strategies at play? Just think…What could “anytime-access” to information like this mean for your work? How Do I Submit Grants Data? There are just two steps to submitting your grants data using the eGrant format. Export a complete list of your most recent grants in Excel. Most grants management software platforms offer a pre-formatted export function that pulls the necessary data into an Excel file automatically. To find video instructions for your platform, click here. If you don’t use one of the listed software systems, simply export a complete list of your most recently-awarded grants into our Excel template. Email your report to egrants@foundationcenter.org. Which data fields do I need to provide? 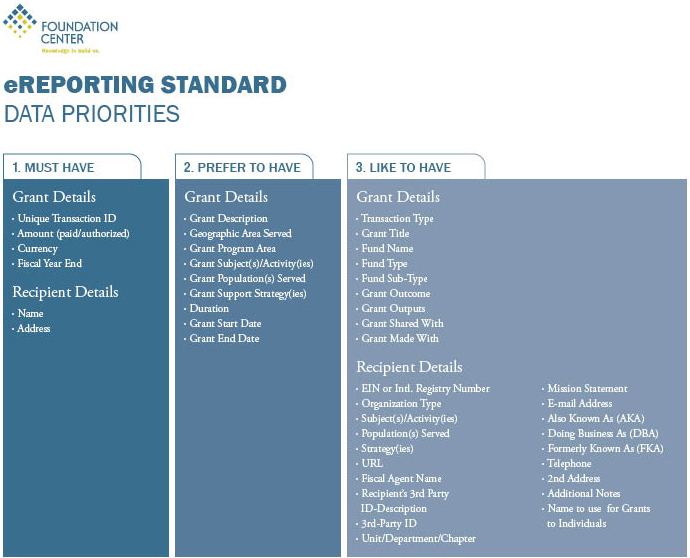 The chart below outlines all of the fields included in the eReporting standard and highlights those that are required and most preferred. As a thank you for sharing your data, you’ll also get access to a custom version of Foundation Maps that reflects your individual organization’s grantmaking activity. Once you see it, picture it populated with the data from hundreds of your fellow funders as well. Starting to see the possibilities? Get on the map today! Click here for more information and instructions on how to share your data. The kickoff of NCG's inaugural Communications Cohort is just a few days away. In advance of the launch, we asked Cohort faculty member, Robert Bray, Director of Communications for NEO Philanthropy, to share how he procrastinates and why for him, the personal is the political. The kickoff of NCG's inaugural Communications Cohort is just a few days away. In advance of the launch, we asked NCG's Vice President of Public Affairs and Cohort faculty member, Emily Katz, to share how the understanding of her identity has changed over time. As we get closer to the kickoff of NCG's inaugural Communications Cohort at the end of this month, we asked Cohort faculty member for former NCG Equity and Social Justice Director, Chris Punongbayan, to share his personal insight into this experience and mid-career growth. As we get closer to the kickoff of NCG's inaugural Communications Cohort at the end of this month, we asked Cohort faculty member Vanice Dunn, to share his personal insight into this experience and mid-career growth.